HJ: On the never-ending journey towards enlightenment and beyond are stages of consciousness. In this article, esoteric writer and teacher Montalk, describes the 3 stages of conscious awakening. There are however even more, but for all intents and purposes these are the 3 that most people will move through in a given lifetime, that is, if they are committed to the path of spiritual growth and awakening. Knowing what phase you are in can be very helpful for understanding what you are going through and making the process much more smooth and enjoyable, among other generally positive things. The common understanding of what it means to be “awake” disguises the truth, which is that despite walking around with eyes open, people tend to nonetheless be hypnotized, dimly conscious, sleepwalking, daydreaming, or in a state of trance. What all these states have in common is that the conscious core of the individual is absent or passive, blowing like a leaf in the winds of environmental stimuli. In dreams we might make the strangest “logical” associations that amount to no logic at all, have little say in what happens to us, do things impulsively, and fail to question our reality or observe ourselves. Compare this to how people tend to behave in everyday life, the anecdotes and gossip they speak, how they might communicate via recitations of lines from movies or TV shows, speak in trite memetic phrases without conscious thought or originality, engage in ludicrous programmed behavior, engross themselves in petty dramas, and switch between goofy or borrowed personalities. For them, dreams do not end in the morning. 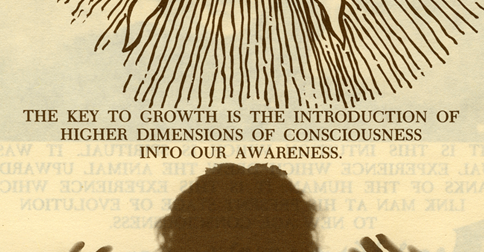 Becoming lucid depends on being cognizant of your own awareness. Some call this self-rememberingsince confluence is the state of self-forgetting. Lucidity is as simple as turning within and remembering yourself in the present moment. Remembering yourself stops confluence, and stopping confluence is the first step to snapping out of what suffocates your spiritual identity. It is one thing to know that you are, but quite another to know who you are. In time, the first leads to the second. Additionally, Vipassana and related exercises such as Robert Bruce’s New Energy Ways or theMicrocosmic Orbit Meditation of Taoist yoga all have the effect of stimulating nonphysical structures and circuits within the etheric body, which if nothing else can help remove blockages and stagnant energies. If properly executed with sufficient regularity of practice, however, these can also awaken certain extrasensory abilities. And thus there is need for a second stage in conscious development that goes beyond mere self-remembering. 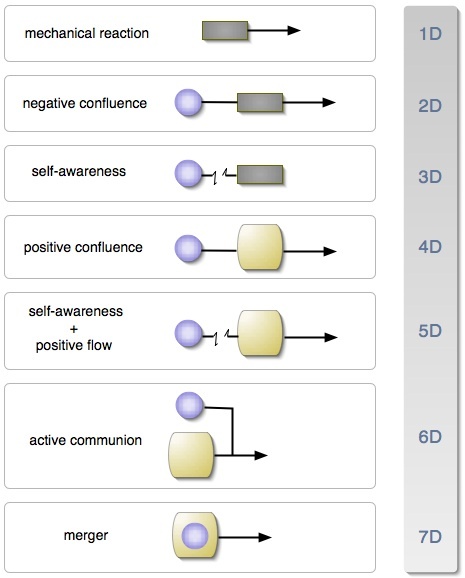 While the first stage aims to interrupt negative confluence, the second stage involves initiating positive confluence with the higher aspects of your being. Speaking from your heart, following your intuition, tapping into your subconscious, virtually “channeling” your Higher Self — these are all examples of positive confluence. Here, you willingly seek out these higher impulses and let them flow as your self-awareness takes a back seat. Reflect upon times when words flowed from you that must have come from something higher. What you said was wiser and more helpful than anything you could have come up with solely on your own. And while they were flowing, you were unaware of yourself as though in a trance (not unconscious, just not _self_-aware). This is a state of being in the flow, in the so-called “zone”. This means that regressive practices carry the risk of losing ego in favor of potentially malevolent influences. Mindless chanting of a mantra, focusing on an external guru, practicing channeling with no filters in place, and slipping into altered states of consciousness for the sake of novelty are examples of things that carry this risk. If you are not engaged in positive confluence with your spiritual core bybeing and feeling it, then there’s no telling what you’re entering into confluence with. It is difficult enough to gain lucidity without interrupting the flow, which is why lucidity must at first be passive in the beginning of the third stage, meaning “watch yourself but do not interfere with the expression of your heart.” This, as distinguished from the “express your heart and higher wisdom by forgetting yourself” aspect of the second stage. The latter is a means toward achieving the first, however, so anyone stuck in Stage 1 to the point of having become more lucid but simultaneously colder inside, should practice entering into positive confluence. That means loosening up and absorbing yourself into positive, productive, creative, empathic, revelatory, and generally spiritual activities. As for esoteric systems like Fourth Way claiming that the higher remains incomprehensible until the lower stages are mastered, remember that there is a difference between systems of consciousevolution and systems of conscious awakening. We are not here to grow our souls from scratch, as there is no time left for that, but rather to awaken ourselves into full spiritual remembrance. We don’t start off life as a blank slate, for the incarnating spirit is already quite seasoned from prior incarnations. The higher centers of the soul may simply be latent or atrophied due to biological and social programming factors we receive from birth that cause neglect and forgetting; if so, then accessing them is not as impossible and incomprehensible as Fourth Way makes it out to be. I think Fourth Way was speaking more for the general mass of dimly conscious people in this world (including spiritless humans) instead of those who are in the upper percentile, but in force fitting the latter into the first it does great harm. The Stellar Man – John Baines. Explores the synthesis of modern psychology and Hermeticism; a thorough explanation of the Hermetic Principles. It also includes a legend of how Moses screwed things up by making a pact with a demonic entity named “Y”. Tom was born in 1980 in central Germany. In early childhood, paranormal phenomena and harrowing alien encounters taught him that reality was strange and mysterious. At age twelve he obtained a library card and began reading all and everything he could find on UFOlogy and spirituality to make sense of his experiences. He also became interested in fringe physics and suppressed inventions after stumbling upon recurring references to alien propulsion systems in UFOlogy literature.